or to stream or download other episodes! All contents Copyright © 2015 by R. Scott Bolton. All rights reserved. Reproduction of material from The Friday Shot Day Show and its website, without written permission, is strictly prohibited. "Super Polka" (used herein as theme for Los Borrachos Playhouse) by Kevin MacLeod (www.incompetech.com). Licensed under Creative Commons "Attribution 3.0" http://creativecommons.org/licenses/by/3.0. 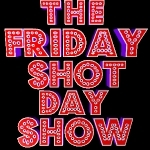 "The Friday Shot Day Show Theme" by JJ No Joke (http://www.myspace.com/jjakanojoke). Used by permission.